Ramp metering and signalling: why are there traffic lights on on-ramps? Home › Advice › Ramp metering and ramp signalling: why are there traffic lights on motorway on-ramps? Make it easier to merge (released vehicles have a clear on-ramp in which to accelerate and get up-to-speed, and they will enter a motorway which has a more measured flow of vehicles rather than large platoons). What are the benefits of properly implemented ramp metering? Priority can be given to vehicles with multiple occupants by having a transit (T2 or T3) bypass lane. Ramp metering gives an advantage to drivers who drive a longer distance on the motorway and enter the motorway at ramps with light traffic. They get the benefits of faster overall flow of traffic on the motorway. Ramp metering disadvantages drivers entering the motorway at popular and congested ramps as it delays their entrance onto the motorway. Overall, ramp metering is designed to extend the life of the existing motorway network by delaying gridlock. 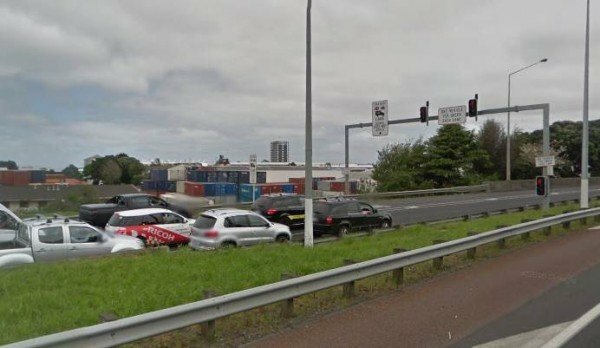 Research in Auckland showed a 25% improvement in congestion duration and traffic speed, an 8% increase in throughput and a 22% reduction in crashes. 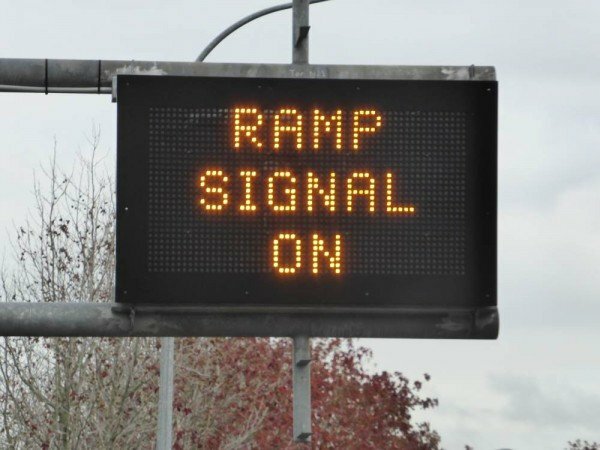 The annual benefit for each installed ramp metering system is a reduction of around 26,000 hours of delay and six crashes, resulting in around a NZ$2.2m saving per installation. Auckland uses the SCATS system. What are the disadvantages to ramp metering? Ramp metering means that new on-ramps must be built longer which is more expensive in road construction. The traffic lights at on-ramps require maintenance and power. Long vehicles find it difficult to get through on one phase. If a motorcyclists filters though the middle of two lanes to the front of the queue there is confusion over whether the other two vehicles that were at the front of the queue are allowed to go. Sometimes ramp metering appears to be in operation for no reason, leading to poor public perception, and possibly more emissions and unnecessary delays. What types of ramp metering are there? Peak time: lights are activated either automatically in response to a certain traffic level on the motorway, or manually by a traffic control centre. They warn of their impending start by flashing orange for a few seconds. When there is no need for ramp metering all of the lights go out. Continuous: lights are activated the whole time. In New Zealand, all ramp meters are peak time although the hours of operation for each set of lights varies. What types of ramp metering algorithms are there? Pre-timed: metering rates are fixed (e.g. one phase very 5.5 seconds). They are determined using historic data. Traffic responsive: metering rates are variable depending on how much traffic there is right now. It uses sensors on the motorway and arterial roads to determine this. More restrictive queue override: If there’s a queue on the on-ramp the system slows the metering down or shuts it off, until the queue has dissipated. Integration between the ramp and upstream traffic signal: traffic lights at the approaches of the on-ramp on arterial roads are also managed to control the flow of traffic onto the on-ramp. The SCATS program uses integration between ramp signals and upstream traffic signals. What types of ramps are there? Within the on-ramp there may be room for one or two vehicles (side-by-side) and one vehicle per green phase is allowed to pass. Some on-ramps, e.g. Mt Wellington in Auckland, also feature a transit lane. What types of signals are there? Signals are the usual traffic light phase: red for stop, green for go and amber to stop. There could be multiple sets of lights at eye level for traffic at the head of the queue and on a gantry for approaching traffic. The image below shows the on-ramp at Mt Wellington, Auckland, heading north. The transit sign can be seen on the left of the gantry for the bus/truck/motorbike/transit lane (T2). Two lanes of other vehicles are held at the gantry waiting for the green light. There could be a sign on the feeder road showing that ramp metering is on.